Bags are more than simple carriers. In an exhibition underway at the Simone Handbag Museum, bags are the source of inspiration for artists, who presented works exploring the meaning of bags in relation to sound. Odd as it may sound to associate bags with sound, the exhibition seeks to explore bags as representations of the personalities of the holders using sound as a theme. As part of a series of exhibitions before the launch of the handbag brand 0941 by Simone, the exhibition “Bag is Rhythm” showcases the creative works of three artists with fresh concepts. On the basement floor of the museum located on the trendy street of Garosu-gil stretches a small exhibition space devoted to artwork inspired by bags. Previous exhibitions have explored relationships between bags and women, and between men and bags. Artist Oh Sein invites the audience to imagine what bag owners would look like by playing sounds and noises collected from voice recorders attached to their bags. The artist believes that a bag resembles its owner because they are always together. She put voice recorders in the bags of a 30-something woman, a 20-something salesperson at a department store and an 80-year-old woman. 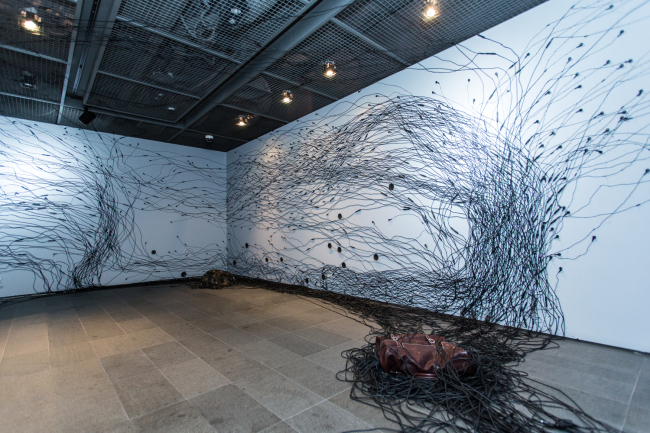 Diverse sounds are heard simultaneously through earphones that are tangled and attached to the wall like vines. The recordings collected from the salesperson at a department store are mostly popular songs played inside the store. Silence dominates the recordings from the 80-year-old woman’s bag. The sounds from the process of making bags has become a major expression of the media art installation by Won Il, director of the Korea Traditional Music Orchestra. Various sounds are heard such as the noises of steel buckles, leather fabric being cut and sewing. Won Il gives note to each sound that might have been a random noise. He creates an innovative sound performance, a mix of tunes and beats. The audience can experience making their own rhythms using the mic-embedded bag in front of the installation. Whenever a person touches tools placed on top of the bag, the sound is amplified by the mic. Czech artist Michael Klega, currently based in Seoul, presents audio and visual languages associated with bags through the installation of Walkman cassette players. 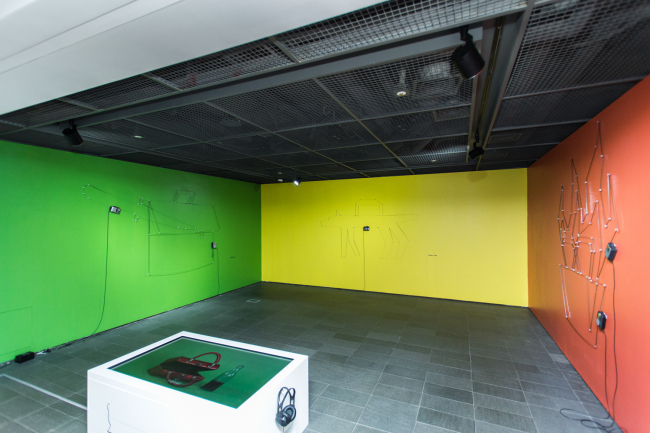 When a person approaches the installation, the tapes automatically move, playing music with a squealing sound. The exhibition runs through Aug. 31 at the gallery on the basement floor of the Simone Handbag Museum on Garosu-gil, Seoul. For more information, visit www.facebook.com/genuine0914.